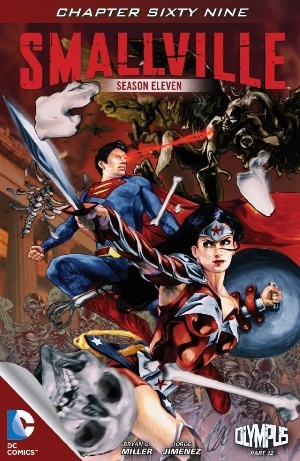 The U.S. President delivers a televised address in which he acknowledges how "out of depth" everyone is with the recent terror and destruction wrought by Felix Faust and Hades, connecting those events with "Contact," when Darkseid and his minions nearly destroyed the Earth in Season 10, and thanks the "rising generation" of heroes like Superman and Wonder Woman for saving everyone. In Washington, D.C., the very same Superman and Wonder Woman talk about godhood and future plans. Wonder Woman is staying "stateside" to act as envoy with Themyscira and to prove that "any who act on their beliefs in pursuit of truth and justice can make a difference." She also plans to see more of Steve Trevor. At Andrews Air Force Base, Hippolyta prepares to return home in what, "for all intents and purposes," is an invisible airplane. Diana, now a DEO agent, arrives to say good-bye. Whether she or Steve Trevor are more "ready for this" than the other will have to wait for another time. Clark and Martha walk alongside the Lincoln Memorial Reflecting Pool and discuss the time when Clark visited D.C. on a school trip. The conversation turns to xenophobia and how people are afraid of what they don't understand. Clark says showing his face to the world wasn't enough and that he has a big step to take. Martha is supportive as ever. Later, Superman repairs the Washington Monument to cheers and flashing cameras before flying off. Clark then joins Lois on the ground. Lois asks whether things are going to be different tomorrow; Clark says yes. They kiss. Later still, Superman arrives at The White House and tells the President that he, Superman, is really Kal-El of Krypton - an alien. And what, then, is there left to say? Well, not much. "Olympus" ends quietly and conclusively, insofar as it's the end of an era, so to speak. Between all those Kryptonians in Season 9 and everything Batman knew about him before they became friends, it strikes me as exceedingly unbelievable that the authorities don't know that Superman is not an Earthling. But I recall the sum of the circumstances surrounding all of this from back in "Guardian" not being especially clear, so let's just be charitable and acknowledge that, structurally, this is a satisfying end. It just also happens to call attention to a major plot point that was never all that satisfyingly developed. Actually, the only thing I really want to talk about is Hades. (Last time, you'll recall, I deferred discussion of the climax because I wanted to see whether certain things would be explained in the conclusion.) From where I sit, "trans-dimensional Greek god-being" is merely half-clever equivocation for "just go with us on this, won't you?" Never mind that I find the use of characters from our own ancient myths in super-hero stories to be redundant (and a tad lazy, on principle - not that there haven't been commendable such stories), this effort to get around the "divinity" of their adversary really more complicates than simplifies the resolution of the conflict. First, why can't Hades still be a "god"? The empirical reality of whatever that word signifies is not less clear than "trans-dimensional god-being." Is it? It isn't to me (and not just because "god" is still in there). And then, either way, if his relationship to "our reality" is "trans-dimensional," why should it matter if Superman throws him into space? Hades, at this point completely free to do as he pleases, has no means of crossing dimensions on his own recognizance? That's weird. As it happens, I'd be the first to buy-in to the notion that Hades is in fact tethered to Earth in space (if not "dimension"), but solving the problem of his wrong-dimensional presence by throwing him into the ground in this dimension makes no sense as a means of trans-dimensional transportation. I'm simply unable to suspend my disbelief on silliness like this. And so I'm no longer going to worry about it. I'll no doubt continue to follow along and read Matt's reviews, and I'll probably comment every now and then, but otherwise it's time to go. Let the era end when it ends, for all of us. Art - 5: Love that Jimenez!